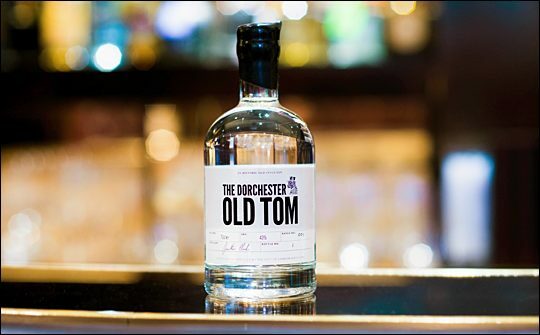 Dorchester Collection’s London hotel, The Dorchester, on Park Lane has revived the historical recipe for Old Tom gin to create a new blend. Perfected by the hotel’s legendary bar manager and expert alchemist Giuliano Morandin, the gin has been distilled exclusively for The Bar at The Dorchester by The City of London Distillery. This is the second time Giuliano has re-introduced Old Tom Gin to the UK drinks market, the first being in 2006 after a 30-year absence. Each bottle of The Dorchester Old Tom gin features a black wax seal and a hand signed label with its bespoke batch number authenticating it as an original. The gin, which will be available in 220 litre batches to ensure that the quality of the flavour is maintained, is available to purchase by the glass or 700ml/500ml/25ml bottles at The Bar at The Dorchester. Giuliano and his team have been closely involved in tailoring the blend of botanicals, which include juniper, coriander, angelica root, orris root, cassia bark, cardamom and fresh lemon and orange peel. There are many tales which recount how Old Tom Gin purportedly got its name, many of which revolve around the unusual and secret dispensing methods used by London gin houses in the 18th century, all of which involved the imagery of a tom cat. To celebrate the launch, Giuliano has created the Old Tom Cobbler cocktail, a summer drink that includes ingredients such as coriander, fresh lemongrass, elderflower and Old Tom Gin. This cocktail will be on offer alongside the Ramos Fizz and Martinez, which inspired Giuliano to revive the production of the gin. Giuliano and his team will also offer private and bespoke cocktail master classes showcasing the techniques and flavours used to compliment The Dorchester Old Tom Gin within the new signature cocktails. A 700ml bottle of The Dorchester Old Tom Gin is priced at £65 and is available at The Bar at The Dorchester or by visiting shop.dorchestercollection.com. Signature cocktails including the Old Tom Cobbler start from £16. The City of London Distillery, located at 22-24 Bride Lane, London, just off Fleet Street is the only working distillery in the City of London. Inspired by the new bespoke gins emerging from small producers, founder Jonathan Clark installed a micro gin distillery in his cocktail bar, setting it behind a floor to ceiling plate glass for all to see. The City of London Distillery & COLD Bar opened for business on 20th December 2012 at 18:58 - in recognition of the first gin cocktail purported to have first been made in 1858.